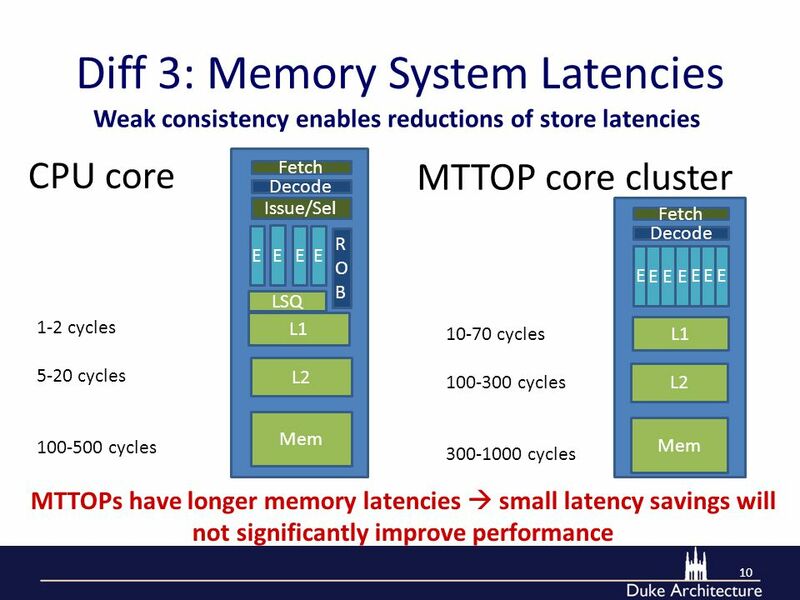 Exploring Memory Consistency for Massively Threaded Throughput- Oriented Processors Blake Hechtman Daniel J. Sorin 0. 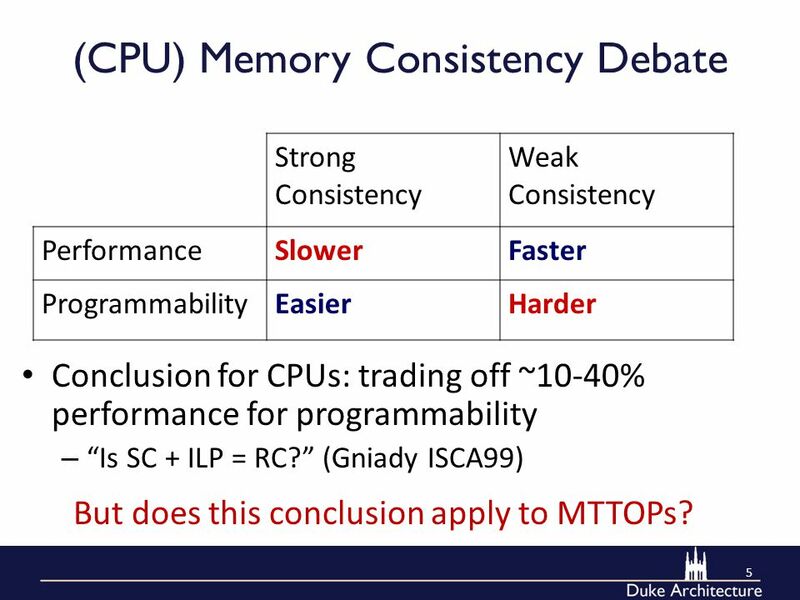 6 (CPU) Memory Consistency Debate Conclusion for CPUs: trading off ~10-40% performance for programmability – “Is SC + ILP = RC?” (Gniady ISCA99) 5 Strong Consistency Weak Consistency PerformanceSlowerFaster ProgrammabilityEasierHarder But does this conclusion apply to MTTOPs? 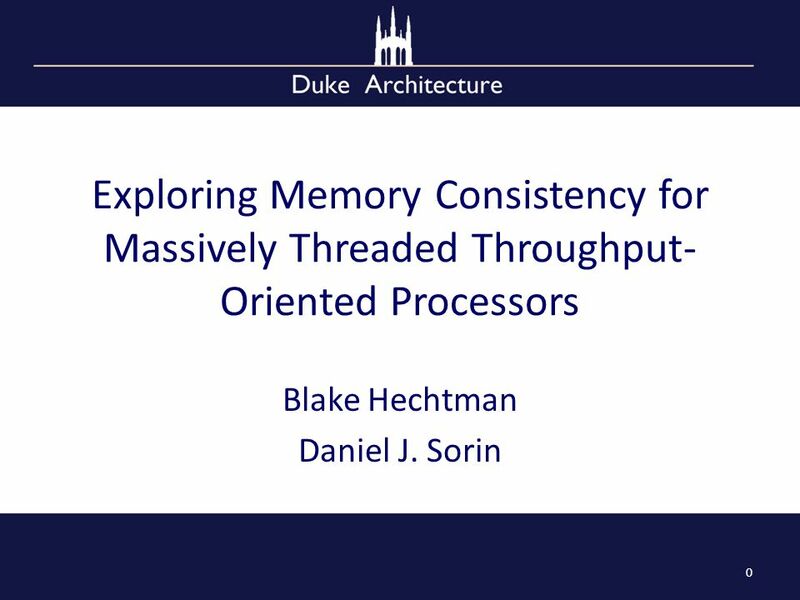 Download ppt "Exploring Memory Consistency for Massively Threaded Throughput- Oriented Processors Blake Hechtman Daniel J. Sorin 0." 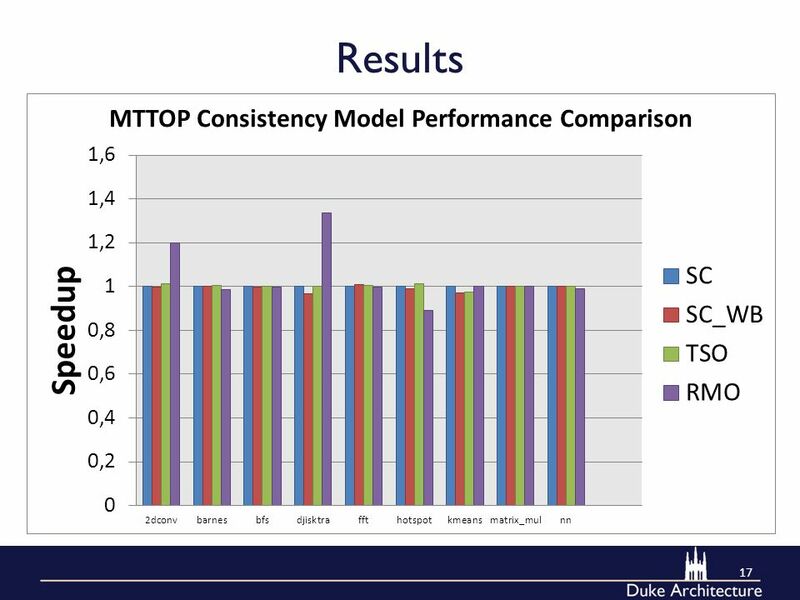 A Performance Comparison of DRAM Memory System Optimizations for SMT Processors Zhichun ZhuZhao Zhang ECE Department Univ. 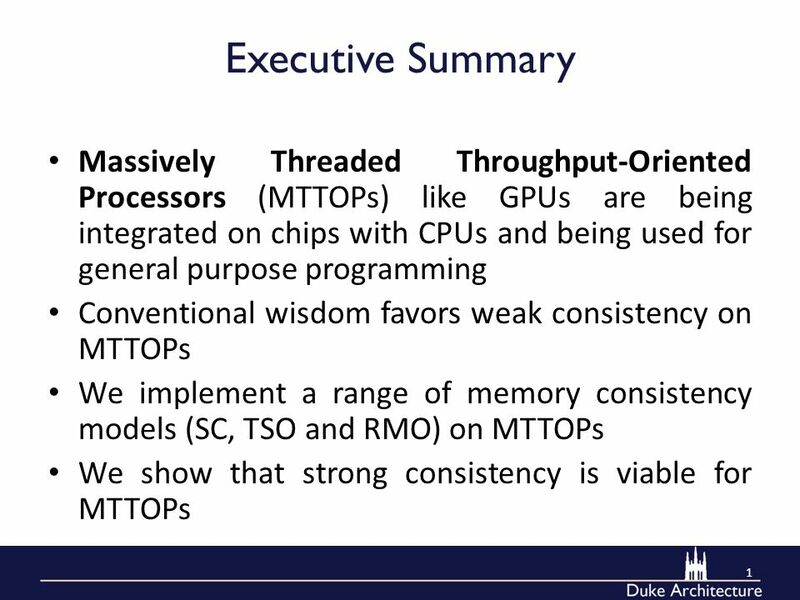 Illinois at ChicagoIowa State. 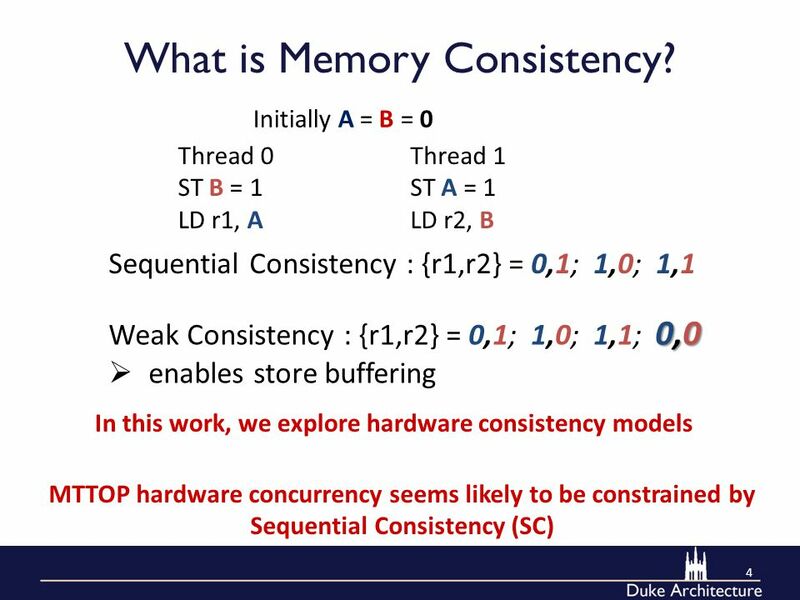 Memory Consistency Models Kevin Boos. 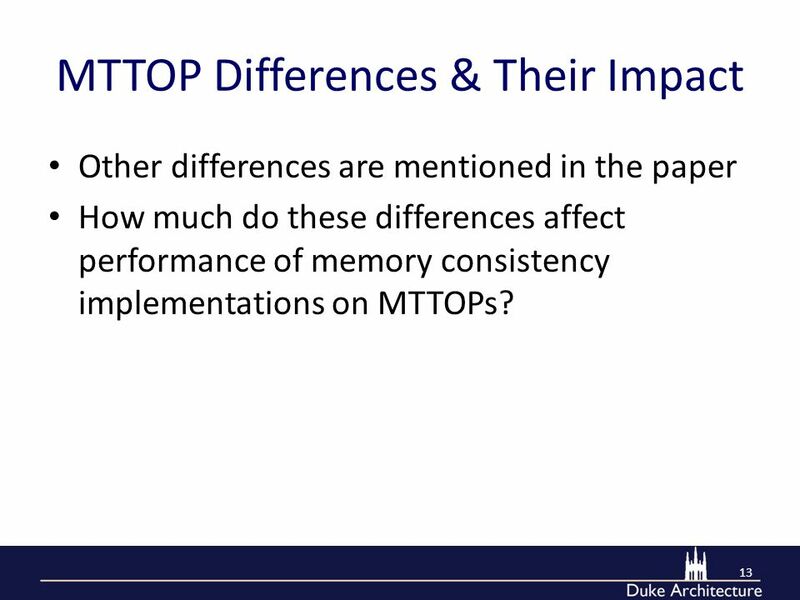 Two Papers Shared Memory Consistency Models: A Tutorial – Sarita V. Adve & Kourosh Gharachorloo – September 1995. 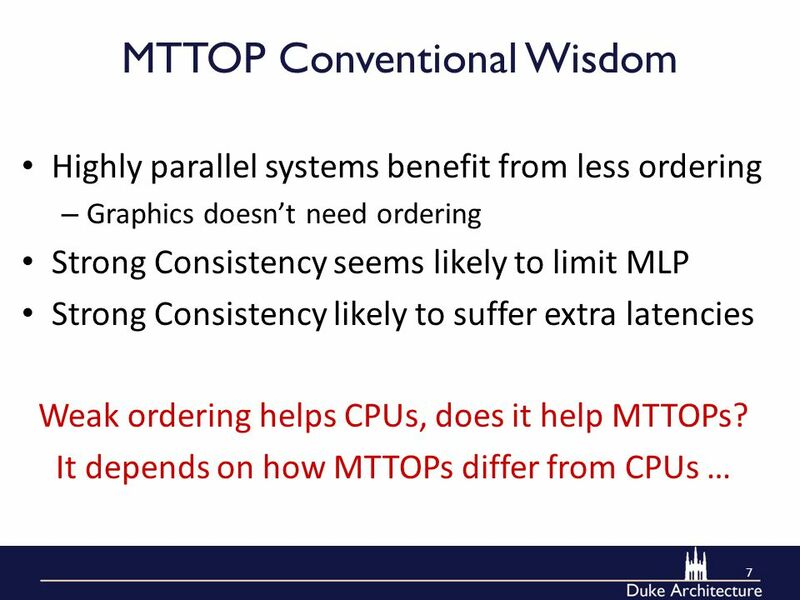 Multiprocessor Architectures for Speculative Multithreading Josep Torrellas, University of Illinois The Bulk Multicore Architecture for Programmability. 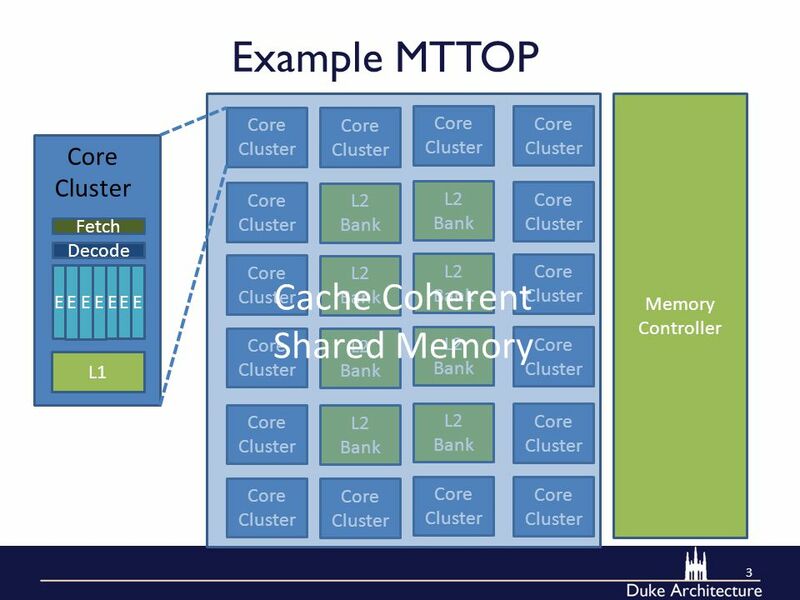 Multiprocessors— Large vs. Small Scale Multiprocessors— Large vs. Small Scale. 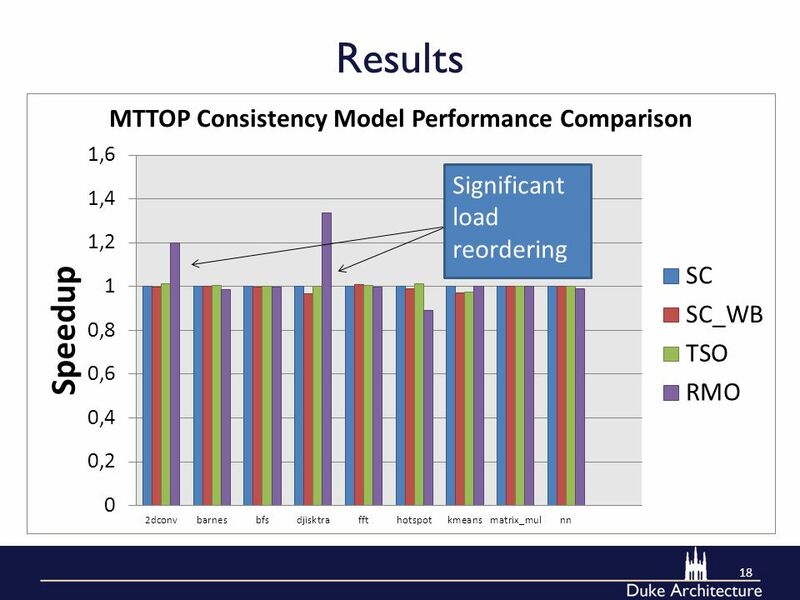 Managing Wire Delay in Large CMP Caches Bradford M. Beckmann David A. 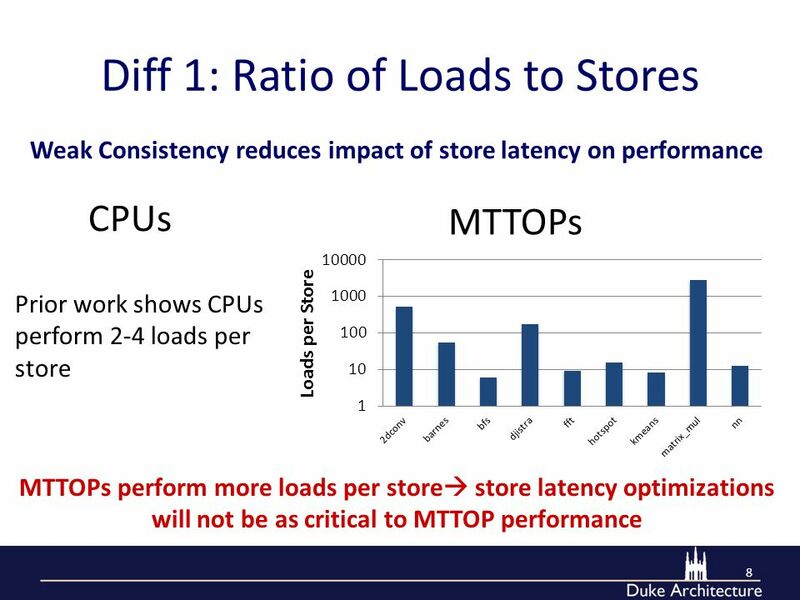 Wood Multifacet Project University of Wisconsin-Madison MICRO /8/04. 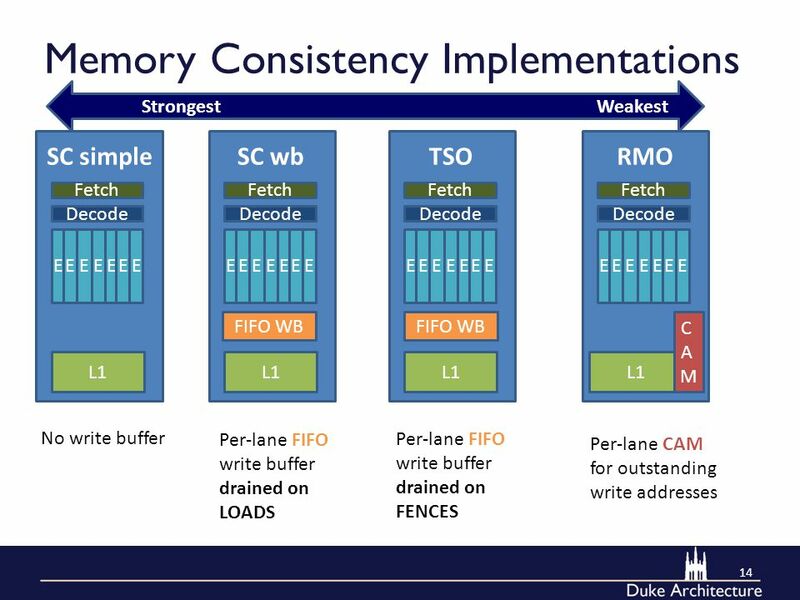 © Krste Asanovic, 2014CS252, Spring 2014, Lecture 12 CS252 Graduate Computer Architecture Spring 2014 Lecture 12: Synchronization and Memory Models Krste. 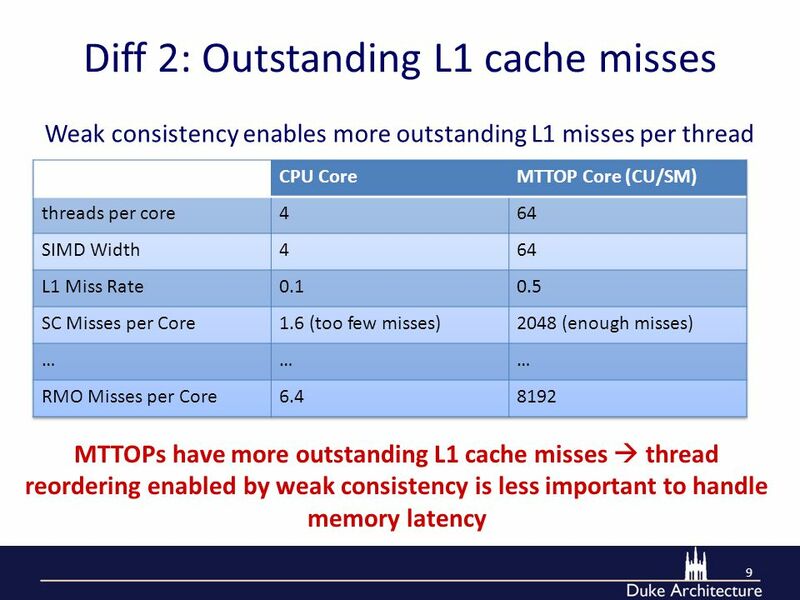 Department of Computer Science iGPU: Exception Support and Speculative Execution on GPUs Jaikrishnan Menon, Marc de Kruijf Karthikeyan Sankaralingam Vertical. 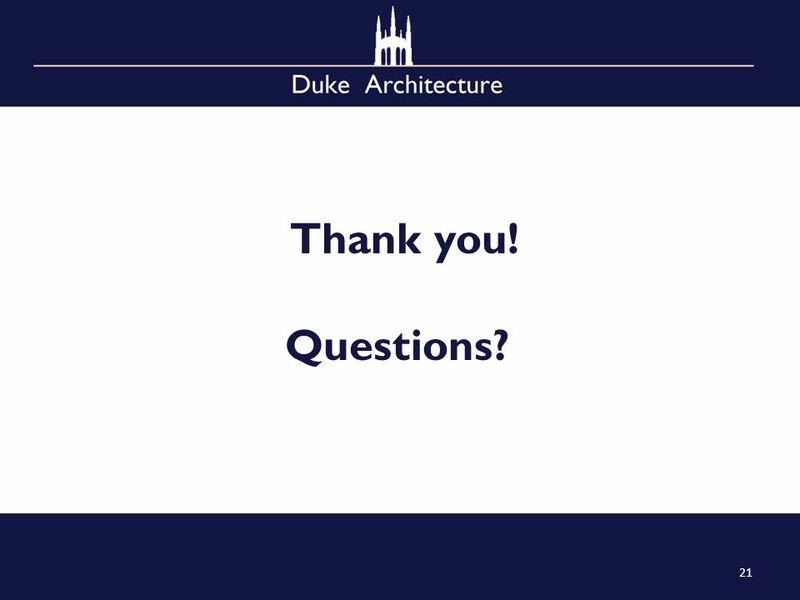 CPU Cache Prefetching Timing Evaluations of Hardware Implementation Ravikiran Channagire & Ramandeep Buttar ECE7995 : Presentation.